Our meeting in the Council Chamber agreed that we should continue the WW1 War Memorial research until we have the best information we can find about all the names on the memorial. 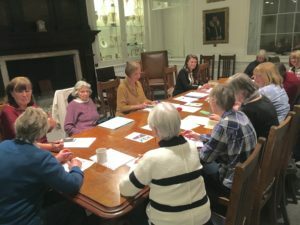 On 21st January, the Unlocking Warwick volunteers held their first meeting of the year to plan community activities for 2019. It was agreed that the research team led by Christine Shaw would continue to seek the stories behind the WW1 names on the memorial in Church Street, at least for the next 6 months and maybe longer. There are still some gaps in our knowledge of local men who died in WW1. The research team will be looking at the Ancestry website and other online sources, and at old copies of the Warwickshire Advertiser at the County Record Office, to seek obituaries and other information. And we still hope local residents will come forward with their own family information, and ideally some photos. The pictures of the men who went off to The Great War never to return are particularly poignant. Email Christine on info@warwickwarmemorial.org.uk if you think you have something of interest about the WW1 Fallen. If you would like to join in with the research project, contact Christine. It’s interesting and illuminating to find the personal stories of these Warwick men who died in WW1.